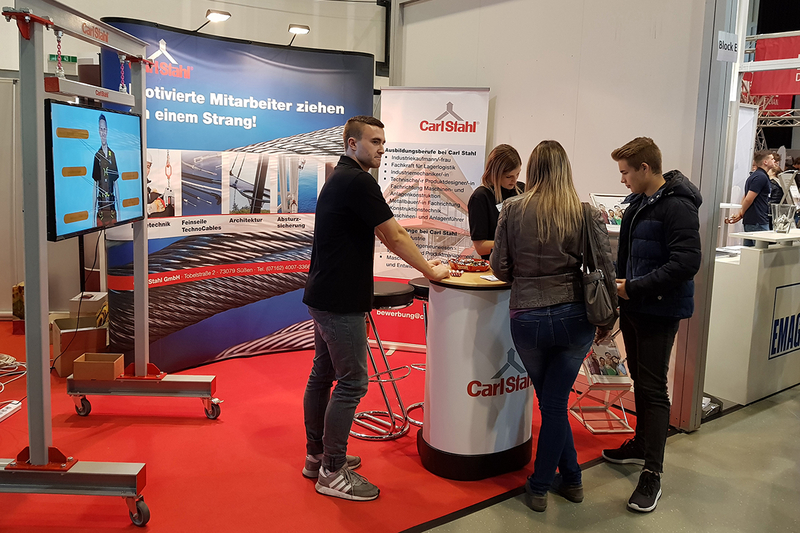 Under the motto "School over - Starting off with Carl Stahl", there was plenty of opportunity for students, applicants and those interested in education to inform themselves with our stand personnel in a relaxed atmosphere about the training and study programs offered by Carl Stahl. And that for the eighth time in a row. "Especially in times in which there are many possibilities to obtain digital information, such trade fairs are gaining in importance. Because only they open the possibility to the interested to plumb their vocational interests in practical and descriptive way and to inform in the personal discussion directly about the characteristics of the appropriate career way", say Edgar Wolff, land chief executive and patron of the education fair 2018 in his greeting word. Carola Gärtner, Head of Human Resources at Carl Stahl in Süßen, also shares this important insight: "At the training fair in Göppingen we have the unique opportunity to present our company as an attractive employer in personal talks. For 2019, we are offering a total of 6 training occupations and 2 dual courses of study as well as various internships."